Seeing that picture of the last surviving farmhouse in Charlotte where Wilson Snell lived, reminded me of a class of Americans that were fairly common when we were growing up, but have all but disappeared. 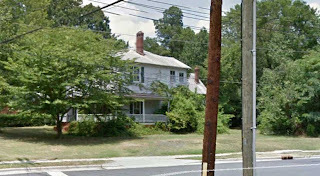 Most often they arrived at the east end of Charlotte and disembarked the train just a few yards behind the Snell property…at which point the trains always slowed or even stopped…for some reason known only to the Southern Railway people. Most of these people are now resting in the Bone Orchard. They led dangerous lives, many wound up greasing the tracks since Flipping on the fly was so dangerous especially when it was a Cannonball. It was a hard existence,constantly being harassed by Bulls and Jungle Buzzards not to mention subsisting on spare biscuits and docandoberries, and sleeping on the ground with nothing but Hoover blankets for warmth. And finally when these men caught the west bound, there were rarely any sky pilots around to utter final comforting words to their friends. The many “historically challenged” Americans of today don’t know diddly squat about Hobos. That’s understandable, since unless they are in their 70’s chances are that they have never seen one. Now, I’m not talking about modern day homeless people that you see everywhere, there’s a big difference. Fairly often, one would knock on our door on East 5th street and offer to do work around our house in return for food. My Mom would usually fix him a sandwich whether she had any work for him or not. I never saw it, but I wouldn’t be surprised if somewhere our house was marked with a symbol only other Hobos could understand. They had their own written language. I recall that most of the Hobos I saw had rolled up newspapers slung over their backs. Those were the “Hoover Blankets” they used to keep warm while sleeping on the ground on chilly nights. I’ve read where,contrary to what you would assume, they really do work surprisingly well. 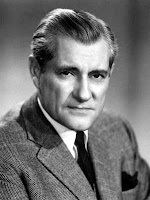 Something else you are going to find hard to believe, but it’s true; Eric Servereid, the debonair, masterful commentator who you will remember appeared regularly on the TV news with Walter Cronkite, once lived as a Hobo. 3. Don’t take advantage of someone who is in a vulnerable situation, locals or other hoboes. 4. Always try to find work, even if temporary, and always seek out jobs nobody wants. By doing so you not only help a business along, but insure employment should you return to that town again. 6. Do not allow yourself to become a stupid drunk and set a bad example for locals treatment of other hoboes. 7. When jungling (living) in town,respect handouts, do not wear them out, another hobo will be coming along who will need them as bad, if not worse than you. 13. Do not allow other hoboes to molest children, expose to authorities all molesters, they are the worst garbage to infest any society. 15. Help your fellow hoboes whenever and wherever needed, you may need their help someday. Hobos have never received the credit they deserve, but they were extremely important to the industrialisation of our country. 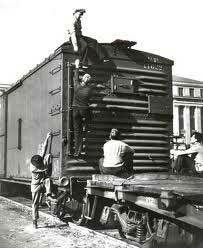 The railroads would not have been able to expand as rapidly as they did without the itinerant labor force the Hobos provided. Neither could the farmers who depended on them to harvest the crops before they rotted. 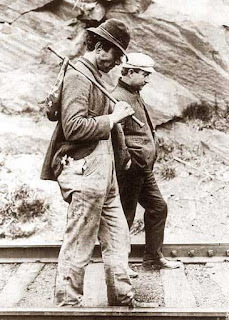 Even though the hobo was an essential member of the industrial and agricultural workforce, society deemed his lifestyle inappropriate and, when not working, relegated him to uninhabited areas outside of the city, or extremely undesirable areas inside of it. The former was known as the jungle, and it served as the home for the constantly fluctuating population of hobos who were traveling to and from job sites. As far as I know there is no "Save the Hobos" movement afoot. Nor should there be. Their time has passed. Bur the least we can do is to understand who they were and honor them for their contributions and for heaven sakes, stop calling them "tramps" and "bums." They were HOBOS...and proud of it. he'd sung his last refrain.